You know that I love showcasing the parties, kids' rooms and style of real Australian families, and photographer Danielle Trovato's style is one of my favourites. 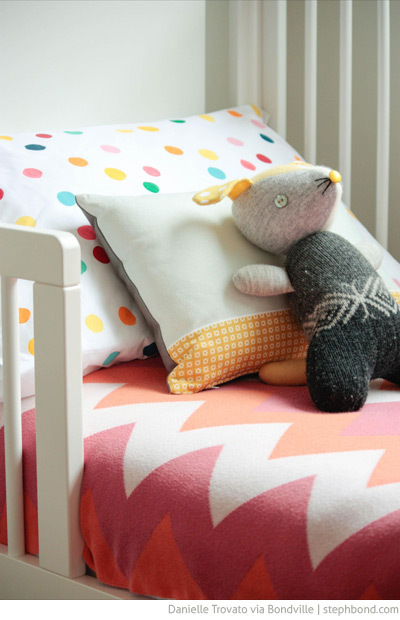 Danielle lives on the Mornington Peninsula in Victoria and is soon to start a photography business focusing on children and children's interiors. 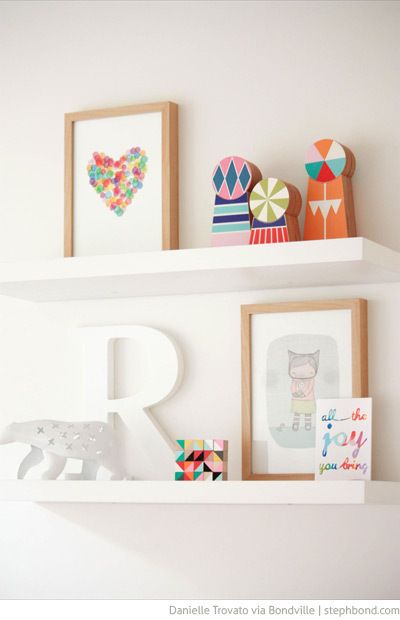 Have a peek at these images of her own daughter Ruby's room, and you'll see why! 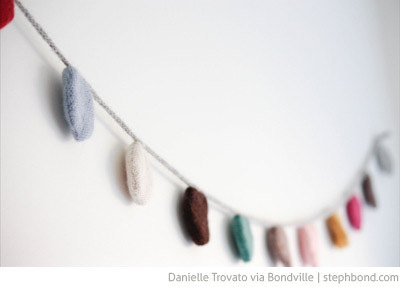 I love that Danielle embraces local Australian design. She made the gorgeous tissue chandelier using paper products from Melbourne-based Poppies for Grace, who also designed the spotty pillow slip and heart print. 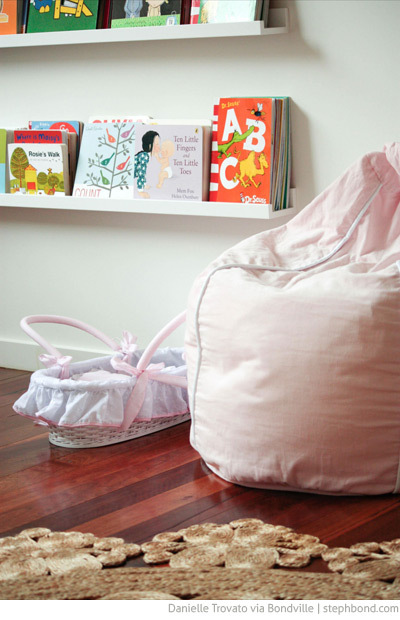 You'll also find a gorgeous Armadillo & Co hemp rug, Cocoon Couture bean bag, Uimi cot blanket, polar bear lantern by MOZI and an art print by one of my favourite Australian illustrators, Nomuu. 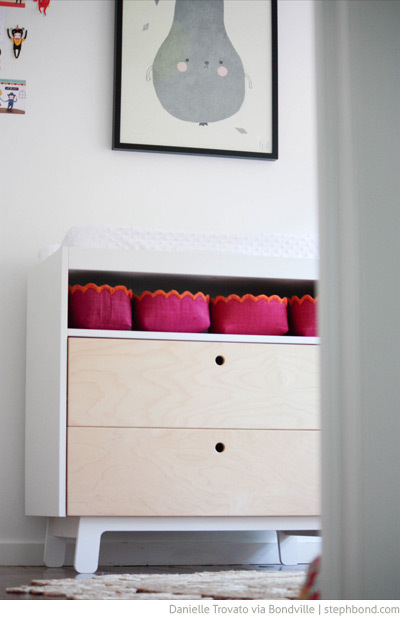 Danielle uses the never-fail neutral-with-splashes-of-colour design style that works so well for kids rooms, allowing for an eclectic collection of toys and art without being too restrictive. Danielle's 'neutral' is a combination of white and natural light wood tones, used for the furniture, shelving, rug and frames. Another great lesson - not all art needs to be framed. 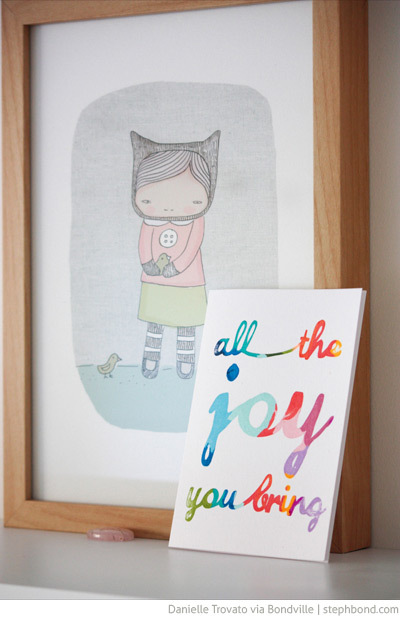 This collection of sweet prints and cards works well unframed and grouped together. 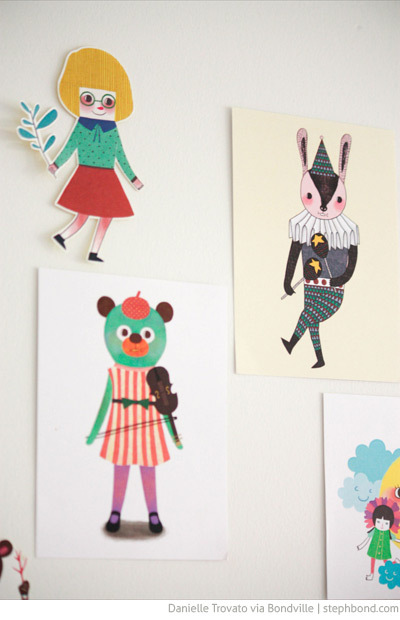 You could also use washi tape to add favourite paper goods to walls for a cute look at is easily removable. 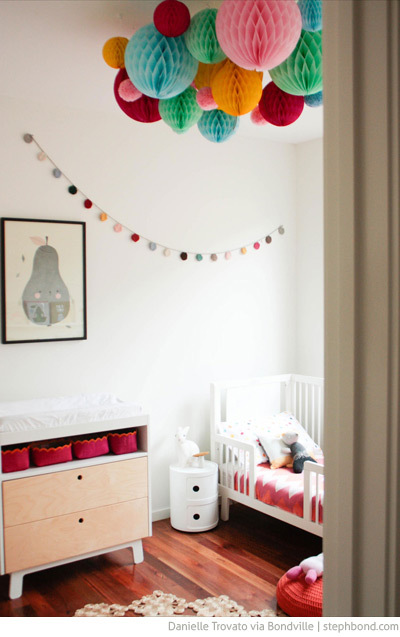 A look that I've been seeing a lot and love is the use of book rails to display forward-facing books in a child's room. 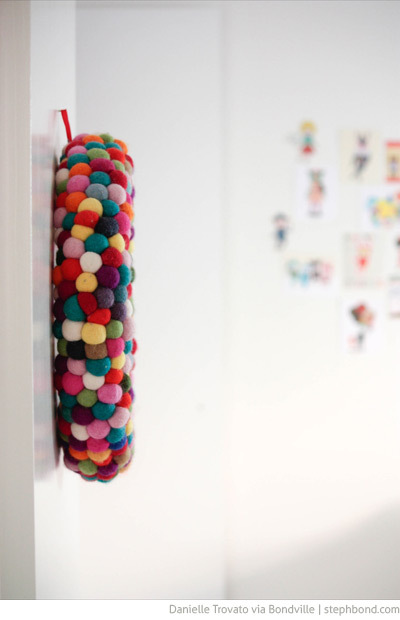 As book stores know well, it's a great way to add colour and personality to a room, and encourage a child to pick up and engage with the books. Much more enticing that a thin spine! Danielle works this look to perfection. 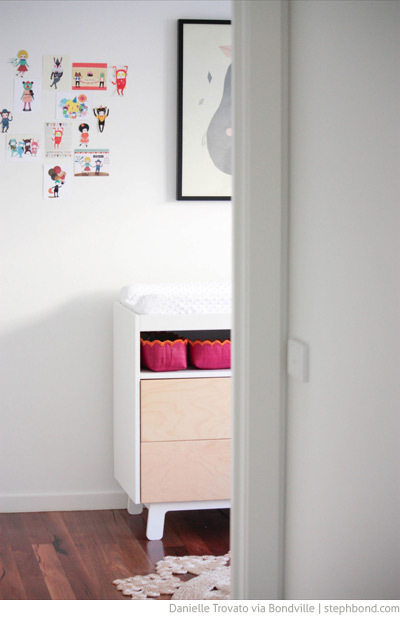 Thank you so much Danielle for sharing with us your daughter's inspiring room and for supporting Australian artists. Danielle's blog is coming soon; in the meantime, you can follow her on Pinterest. There's a lot to like here. I love the book rails too, such a cute idea. I will have to wait until Lucinda is a little older though, she just likes grabbing her books to try and pull them apart currently. 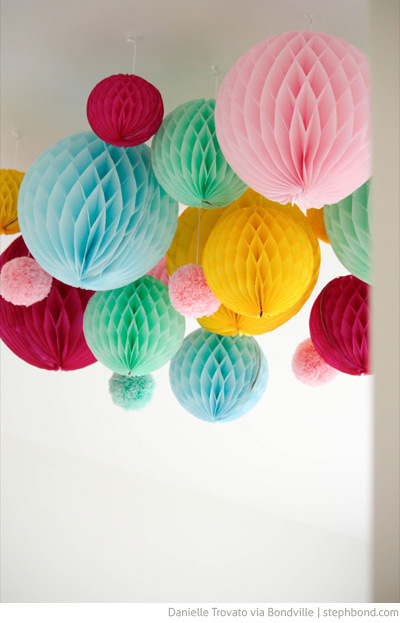 Love the paper lanterns too. CUTE! What a gorgeous, gorgeous room! I'd be happy if it was mine! Hi @Edwina and @Amanda - those book rails are definitely genius. @finelittleday - your Pear poster is amazing Elisabeth! @Lisa - me too. Just our cup of tea. I agree with your comment with not all art needs to be framed. Sometimes to most amazing and extravagant things are the simplistic. I really do like this rooms decor. Thank you for sharing.